The Church of the Annunziata is an influential example of the Piedmonts Baroque, particularly as regards the art of perspective applied to Quadraturism (a decorative technique that involves imitating and inventing fantastic architectures painted with fake marble and fake decorated furnishings). The original church was built outside the ancient walls, near the gate of Val di Villa on the road that led to Alba in the mid-sixteenth century (the altarpiece commissioned to Guglielmo Caccia for the church is, in fact, dated 1585). The ancient primitive oratory bore the name of “Our Lady“, “Ecclesia Beate Marie Virginis ad portam Vallis Ville”, as it is called in the Latin sources of the late 16th century. The cult of the Virgin Mary as the “Annunziata” started only later, probably thanks to the better religious education of the masses due to the preaching of the “Servi di Maria”, a monastic order founded in 1233 in Florence by seven Founding Saints belonging to important families of the city, and present in Vezza on the hill of “Madonna dei Boschi”. The ancient oratory, rather modest in size (the internal width was about five meters), had neither a choir nor an apse; the wooden altar rested directly on the back wall. Only in 1679, was it flanked by a small bell tower. In 1695 the Chapter decided to erect a new choir behind the altar (the current presbytery and choir). It had a quadrangular plan with the smaller side measuring about seven meters and it was fifty centimetres higher than the existing building; the dimensions and height were such as to show the intention to later replace the small chapel with a much wider and taller construction. The construction of the new Church thus began as an extension of the old one. In 1699 began the construction of the central hall of the new church. The original design bears the signature of Baron Francesco Rachis of Carpeneto, lord of Verduno. The construction of the new Church continued until 1713, when it is believed that it was almost completed in full. In 1721 began the construction of the new bell tower, to replace the one built in 1679. The bell tower was placed against the west side of the church and rotated by 45° with respect to the longitudinal axis of the church. Around 1830 was finally built the two-story part, symmetrical to the sacristy with the choir. But, as already mentioned, the paintings located inside were the element on which the Guarene community invested the most: the peculiarity of this monument is, in fact, the representation of the architecture of the dome in its entirety, without recurring to figurative representations that reduced the difficulty of enclosing the images of the fake architecture. The quadraturist painters who contributed to the Church of the Annunziata were Francesco Casoli from Guarene, who had attended the Bibiena Galli School, Vittore de Nicola from Locarno and Giacomo Rapa (Rappa), perhaps from Lugano. The paintings (the four evangelists depicted on the sails of the dome, the figures depicted on the organ doors, and the side frescoes of the choir) are the work of Michele Antonio Milocco, also the author of the large oil painting on canvas representing the Annunciation and placed on the main high altar, of the painting of St. Elizabeth of Hungary above the left altar, and of the Deposition above the right altar. The three impressive paintings by Milocco have recently been brought back to their original splendour thanks to a restoration work. The 17th-century wooden choir is also of great value. 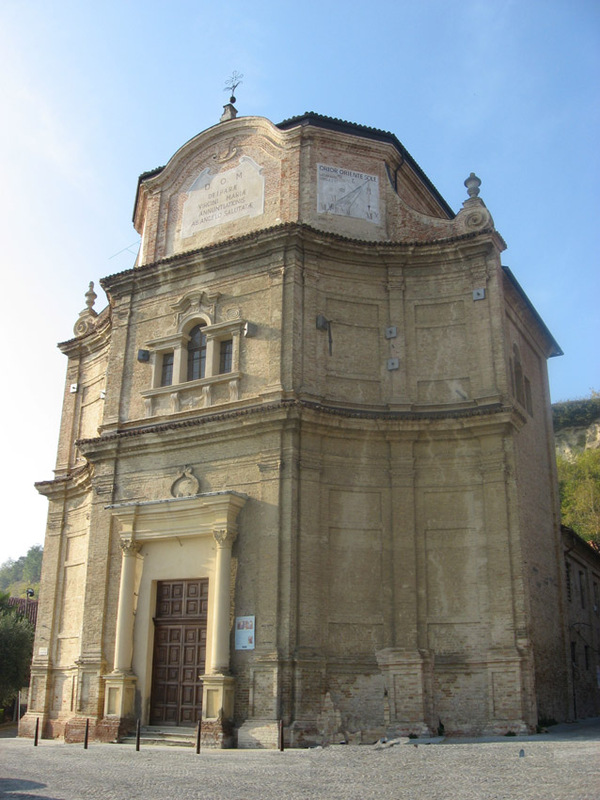 A significant example of 17th century Piedmonts sacred architecture, in 1909 the Church of the Annunziata was declared “Fine monument of art and history”. The restoration work begun in the mid-90s and was completed in 2013; it concerned the severely compromised architectural structure, the plasters, the decorations, the furnishings, and the paintings. The restoration was carried out thanks to the support of the “Compagnia di San Paolo” of Turin and the joint commitment of various other public and private entities: the Ministry of Cultural Heritage, the Piedmont Region, the Province of Cuneo, the City of Guarene, the Civic Library of Guarene, the Cassa di Risparmio Foundation of Cuneo, the Cassa di Risparmio Foundation of Turin, the Curia of Alba, the Ferrero Foundation, and the European Funds for Regional Development (ERDF). The original altarpiece by Moncalvo depicting the “Annunciation” was placed in the sacristy, while the canvas representing St. Michael, belonging to the homonymous church, also painted by Guglielmo Caccia in 1585, was placed in the oratory; these works of art represent the first period of the great Piedmonts painter. Both works have been brought back to their original splendour with careful restoration. The church also includes numerous furnishings, vestments, and eighteenth-century processional banners. Thanks to the agreement between the City and the Bishop’s Curia, the Church can host concerts, exhibitions, conferences, and other cultural events.